Born ABT 1450 or a little before, son of Peter Empson of Towcester and Elizabeth Joseph, he rose to be one of Henry VII's chief ministers. He was described by John Stow as the son of a 'sieve- maker' of Towcester, but Peter Empson was a man of considerable local importance who could afford to have bis son trained as a lawyer. All Henry VII's chief advisers among the laity were of gentle birth, and it seems probable that Empson was too. Richard Empson soon had a busy legal practice, especially in the Midlands, and was appointed a Justice of the Peace. In 1478 he was made Attorney-General in the Duchy of Lancaster, an office which he lost on the accession of Richard III, but recovered after Bosworth. 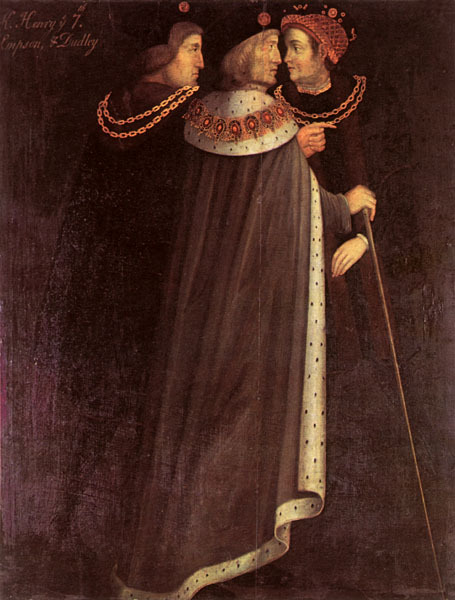 Empson was therefore typical of many royal servants who staffed Henry VII's administration in that he had gained experience under the Yorkists. He was Member of Parliament on several occasions in Henry VII's reign and in 1491 was chosen Speaker of the Commons, a position showing he had royal favour. Empson came to prominence in the later years of Henry's reign. In 1505 he was finally made Chancellor of the Duchy of Lancaster, but his most important work was as royal debt-collector and associate of Edmund Dudley. The two men worked closely on a rather mysterious body known as the 'Council learned in the law', a sort of committee of the royal council which met from at least 1495 and which saw that the King's monies were collected. From ABT 1502, it seems clear that Henry's government of England became stricter and that the burdens imposed on the rich especially grew. Bonds for good behaviour were placed on many of the upper classes, and they suffered severe financial penalties if they stepped out of line. In consequence, when the King died, there was something of a reaction. The young Henry VIII, anxious to make himself popular at the beginning of his reign had Empson and Dudley arrested the day after his accession. All the pent-up hostility to the old King's way of doing things was directed against these two unfortunate ministers. The main case against them seems to have been that they enforced the law and legal agreements too strictly. So, trumped up accusations of treason were used against them and on 17 Aug 1510 Empson was executed. It is worth noting that Empson himself was placed under a bond in 1504 to prevent him persecuting an unfortunate royal chaplain who had written satirical verses against him. This would seem to indicate that any harshness in Henry VII's reign, if such there was, carne eventually from the King and not his ministers, and that it was inflicted in the interests of justice and good order. M. R. Horowitz, Bulletin lnstitute Historical Research, 1982.